The effectiveness of advertising depends, to some degree, on the content that surrounds it. In other words, content context has a direct impact on the way advertising is received. A new research study, “Why premium editorial content” from Teads, a native video advertising marketplace, analyzes why premium editorial content creates more impactful environments. Teads partnered with Neuro-Insight, a neurological research firm, to better understand how premium content neurologically changes the way people recall advertising messaging. Four premium publishers, Conde Nast, Forbes, Time Inc. and The Atlantic participated in the research to expose video ads within their premium editorials on mobile. Consumers were also exposed to the same video ads within their personal Facebook feed in order to compare the two experiences. The research revealed that premium editorial content is 16% more personally relevant and engaging than social news feeds. 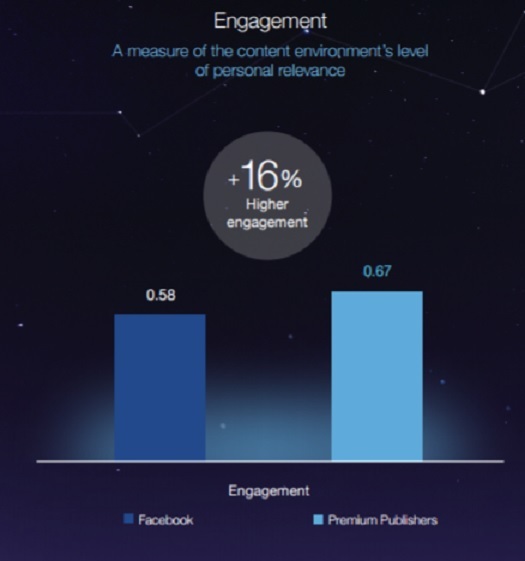 Interestingly, regardless of the personalization capabilities in a user’s Facebook feed, consumers still felt more personal relevance to the premium content. 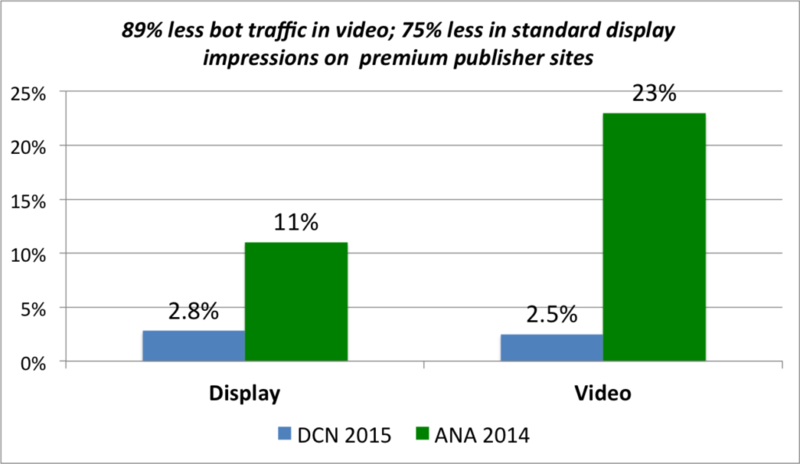 Users invest more of themselves in the premium editorial consumption experience. What makes this finding so important? Premium editorial delivers a more powerful memory impact and a more memorable advertising experience. For the detailed-oriented left-side of the brain, premium editorial had a 19% greater impact on memory and for the emotional right-side of the brain, it had an 8% greater impact on memory. Memory encoding drives higher ad effectiveness and is an influencer of consumer purchase behavior. 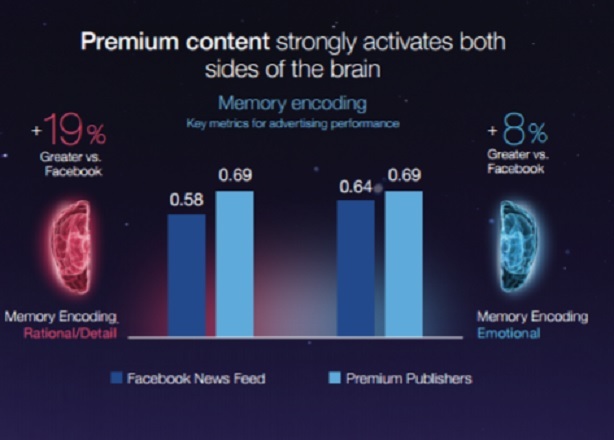 Interestingly, both premium editorial content and Facebook social feeds create high impacts on long-term memory, however, premium content generates a greater and more even activation in both the left and the right sides of the brain. The triggering of both sides of the brain offers the best opportunity for broad video advertising creative approaches to influence a consumer’s long-term memory. Premium content is unique because of its impact to both the left- and right-side of the brain, meaning, it has an equal and considerable opportunity to influence consumers. It’s not just that premium publishers offer advertisers a quality audience, their content also creates a higher impact on advertising. Teads’ research concludes that content with a high level of engagement is more likely to impact the memorability of online video advertising. Importantly, premium content raises the level of impact that social platforms cannot duplicate. Location is fast becoming one of the most powerful means for identifying and delivering on consumers’ real-time intent. It also offers a means to create purchase incentives and foster engagement and provides the ability to tap into precise moments of decision making. Forbes Insights, in association with xAd, has released a new paper entitled Location: A Strategic Marketing Imperative. For this paper, Forbes Insights conducted interviews with some of today’s leading brands on how they’ve effectively leveraged location. According to the paper, location-based mobile advertising has become more than simply a nice-to-have tactic in a marketer’s toolkit. Rather, it’s fast becoming a strategic imperative in today’s data-driven, highly competitive landscape. Given mobile ubiquity, and the impact of apps such as Uber, Tinder and Yelp on consumer’s expectation of personalized, relevant experiences, location-based services promise to enhance consumer experiences, whether purchasing products online or browsing the aisles of a brick-and-mortar retailer. Forbes Insights found that, as these trends develop, location-driven campaigns promise to close the gap between online and offline worlds; browsing and buying; expectation and delivery. The popularity of instant messaging (IM) has soared over the past year, with a 12% uplift in daily usage as more people opt for closed messaging platforms such as WhatsApp, Facebook Messenger and Viber. Over half of internet users worldwide (55%) are now using instant messaging every day, while 76% are using it on a weekly basis, according to Connected Life, a study of over 60,000 internet users worldwide from global research consultancy TNS. Despite this, social platforms are still rising in popularity with a 6% uplift in daily usage. As people’s online habits become ever more fragmented, TNS asserts that brands need to tap into the growing popularity of IM and other emerging platforms. The research shows an increased need for a content-driven approach across IM, social and traditional channels. The US still lags the ‘mobile-first’ markets with 35% of US internet users using IM every day, but is catching up quickly (up 10% compared with 2014). Instant Messaging (IM) is particularly dominant in emerging “mobile-first” markets, with daily usage rising even higher in markets like China (69%), Brazil (73%), and South Africa (64%). Facebook has maintained its position as the world’s favorite social platform; almost one third of global internet users (30%) say they use it every day. Facebook’s dominant position among US internet users is even stronger at 53%, followed by YouTube (26%), Instagram and Twitter. TNS found that although IM users are wary of brands interrupting them, they are more concerned with how content they share impacts their own image. TNS data reveals that consumers are even more connected to each other, and across multiple platforms. While IM popularity is rising, traditional social media platforms are still holding strong, allowing content to go viral more quickly. The challenge, says TNS, is for brands to create content that consumers actually want to share. This week nearly 7,500 people from 89 countries made their way to two airplane hangars in downtown Las Vegas for Collision, a “new kind of tech event,” in which tech is approached as an intrinsic part of every aspect of business. In addition to sessions on four main stages—Center, Enterprise, Builders and Marketing—the event attracts speakers and attendees from Fortune 500 companies to nascent startups, along with no small number of VC and Angel investors. What they all have in common is a focus on what’s next and driving the innovation that will take us there. 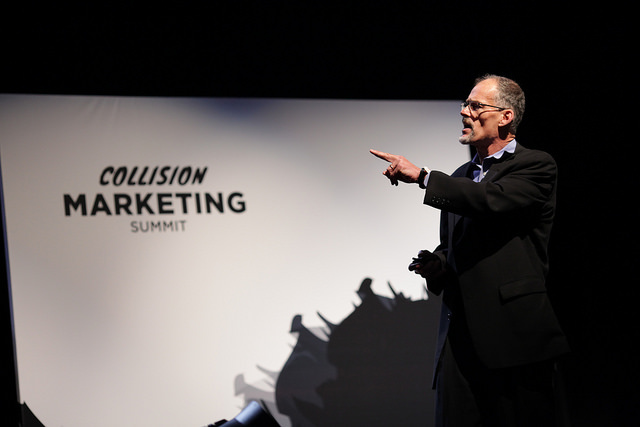 While tech was undoubtedly the underpinning of the vast majority of sessions and conversations, marketing was also central to many discussions—given that few of the “big ideas” brewing at Collision will go far without it. Programmatic with polish: Without a doubt, speaker after speaker confirmed the growing dominance of programmatic. In fact, eMarketer founder and CEO Geoff Ramsey kicked off the day with a slew of stats, including that we can expect to see $15 billion worth of advertising bought programmatically this year, comprising 55% of all display. And while Digiday’s Ricardo Bilton pointed out that “The promise of programmatic is that it is intensely efficient,” a number of people throughout the day made clear that they were looking forward to the continued evolution of programmatic to be more creative and contextualized. Howard Pyle, VP of Marketing at IBM, said that while programmatic is “a convenient way to make marketing function more like a machine” he remains focused on creating customized experiences that best suit his different customer segments. Thus, he is exploring how he can create “unique experiences at scale.” And Anthony Mazzarella, SVP, Agency Sales, at Celtra says that this creates an opportunity to “bring marketers and the media closer together,” which can only make the experience better. Content marketing that leverages digital video is seen as one of the best storytelling mediums by marketers and is garnering bigger, standalone budgets accordingly, yet these same brand advertising executives are challenged with justifying its ROI, according to a qualitative study— Content Revelations— from DigitasLBi and IAB, and conducted by Advertiser Perceptions. According to the research, measuring ROI vs. other media is the top obstacle among marketers for increasing their spending on original digital video. Two-thirds of marketers and agency executives believe that original digital video will become as important as original TV programming within the next three to five years. Original digital video is expected to climb from 37% of marketer’s total video budgets in 2014 42% in 2015. The majority of marketers (64%) anticipate increasing their digital video ad spend in the next 12 months. 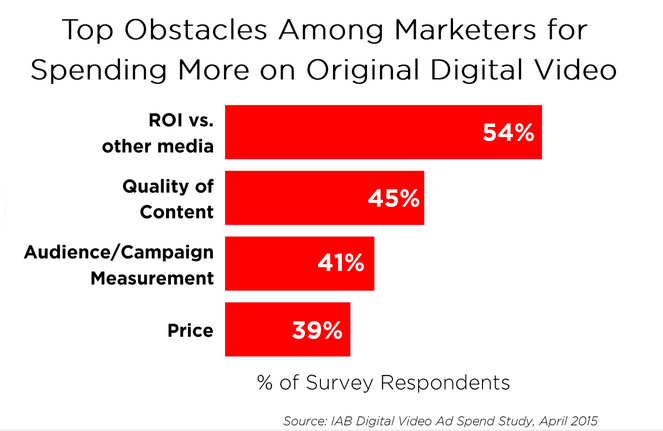 Measuring ROI, followed by content quality, audience/campaign measurement and price are the top obstacles preventing marketers from spending more on digital video. Nothing makes a narrative more compelling than a villain: evil that must be overcome so the hero can prevail. Maybe that’s why every few years a new nefarious buzzword arises that both energizes the digital media industry and rattles the cages of the establishment. But the business of digital media is just not as tidy as a formulaic series. The real problems are complex. And the bad actors aren’t parading their final 15 minutes of fame on Dancing with the Stars, they are lurking in the shadows, profiting from marketers’ best intentions and the great content created by others. While the story of programmatic is barely a few years old, the plot lines are deep and we’re clearly still early in the first season. It wasn’t too long ago that programmatic was referred to as the latest chapter in digital media’s “race to the bottom.” The word was associated with everything bad in the digital advertising supply chain because it started off as a murky pool of third parties offering marketers an easy way to reach massive (if dubious) audiences and for publishers to offload “remnant” inventory at bargain basement prices. Unsold inventory from great brands mixed with a whole lot of garbage—the old ad network model. This (thankfully brief) period in the story of programmatic did little for anyone besides intermediaries—though it did help draw attention to the fact that digital advertising processes were ripe for change. The reality is that programmatic emerged as a response to the complexity of the digital ad buy and has evolved into a way to automate as much as possible, making digital media easier for marketers to buy and potentially more profitable for publishers. Our research shows that forward thinking media companies have wisely jumped into the programmatic fray in order to address marketers’ desire for efficiency while also leveraging their first party audience data to deliver highly targeted, efficient and impactful campaigns. Yes, a whole lot of programmatic inventory is still remnant but that is starting to change as more premium inventory becomes available for programmatic buys. In fact, a growing number of our members are starting to see programmatic guaranteed and preferred deals that rival direct deals in terms of CPMs. The big difference is that the programmatic deals—those that have pre-agreed prices and guaranteed high-quality inventory—offer automation of the back-end processes. As representatives for the digital content brands that marketers trust, it is our responsibility to shine a light on any “trust parasites” in programmatic and to work with advertising and agency partners to maximize their confidence in the value they will receive when they put money into programmatic. The rise of programmatic direct and private marketplaces offer an example of how this is taking shape. And right now, buying direct from a trusted premium publisher is the best way to execute a programmatic campaign without risk. Villain’s and heroes aren’t what we need to focus on in the story of digital media. However we do need to recognize that there’s a lot at stake here if all of the players don’t work together to educate the market, given the predictions that programmatic will dominate digital advertising within a few years. If you are one of the few still debating whether or not to embrace programmatic: Stop now. Automating the bidding, buying, securing and execution of an ad campaign in real-time using machines rather than paper and humans is a no-brainer. If you put on your marketer cap, it’s fairly obvious. Do you want your ads to be viewable meaning actually show up in the active window? Absolutely. Do you want your ads to be in front of humans rather than bots? Um, of course. Do you want your ads to run in a clean, well-lit brand-safe environment? Yes, please. Do you want all of the above as easily as possible? Bring it on. With every change, every challenge comes an opportunity to step up and “save the day.” And there are few better examples of the opportunity for digital innovation than programmatic. Get on board and let’s drive this narrative forward. The Modern marketer is a multichannel strategist, relying most heavily on email, direct mail, and social media according to the DMA’s 2015 Response Rate Report. DMA’s research found that 65% of respondents use two or more media types in their marketing campaigns, with 44% reporting they use three or more. Of the seven key channels examined (Mobile, Email, Online Display, Paid Search, Telephone, and Direct Mail), Email ranked at the top, with 8% of respondents reporting they used the channel in their marketing campaigns. Mobile represented the smallest sample in this survey, which the DMA interprets as indicating that it is not yet being fully utilized by marketers. However, mobile shows the greatest promise for growth over the next 12 months — with 73% of respondents indicating plans to increase their usage. The report also finds that the mobile channel is rarely used on its own; 98% of mobile users employ at least three types of media in their campaigns— and 65% use at least five. The report is available at the DMA Bookstore for $299 for DMA members and $499 for non-members. Publishers would have you believe that environment matters more than ever when it comes to the effectiveness of digital advertising. The Financial Times wanted to make this more than a theory. To that end, on March 4th, 2015 Daniel Rothman, director of marketing and insight at the Financial Times, presented The 2015 Halo Study – new research that set out to test (and prove) that environment matters more than ever in digital advertising. While this is not the first time this type of research has been conducted (i.e., BBC’s Advertising Dress Test, IAB’s VW campaign test, and DCN’s Branding on Display Research), it’s easy to understand the need for regular updates to this research given the constantly evolving digital landscape. “This research highlights for advertisers the importance and relevance of websites affiliated with traditional media companies and helps educate (in Halo’s case, using neuroscience) how brands are clearly viewed depending on the environment that they appear within,” Rothman said. 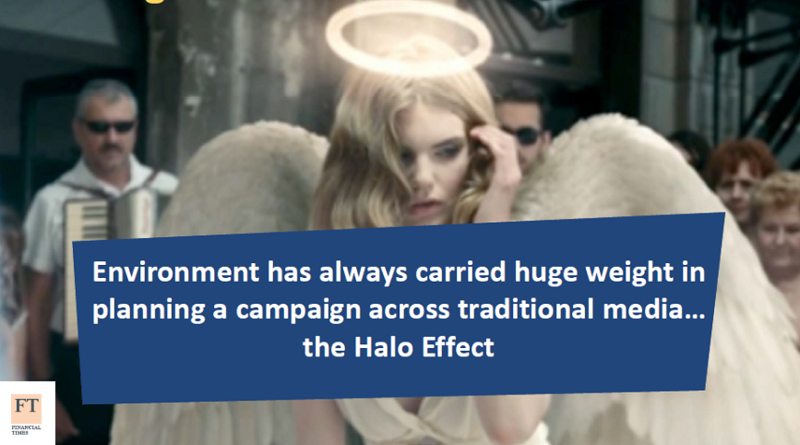 The FT study coined and defined the term “Observable Halo Effect”: the subconscious perception that brands that have ad placements next to high-quality content benefit from the “halo” of that publishers brand, creating trust, and positive measures for their brands. The FT research looked at six brands and nine content providers; brands with ads on the more established content providers (FT, New York Times, Wall Street Journal and Bloomberg) garnered significantly higher brand perceptions, or Observable Halo Effect, compared with brands with ads on emerging sites (Huffington Post, BuzzFeed, Drudge Report, Twitter and LinkedIn). 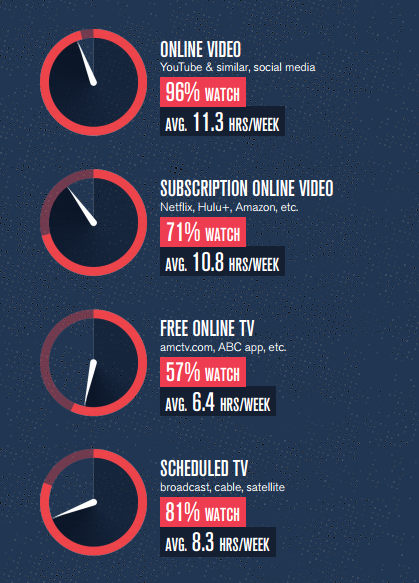 Not all content providers are equal. Established content providers are more likely to be perceived as high quality, trustworthy, and more prestigious than non-traditional media owners. You can’t fit a square peg in a round hole. When consumers act like media planners, they place 50% more ads in established content sites compared with emerging sites. Right environment = implicit added value to a brand. 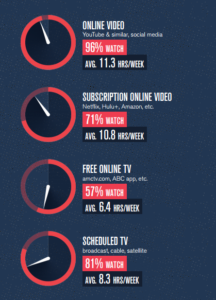 Customers implicitly have a higher perception of the brand and a quicker reaction time indicating the best natural fit with established content providers. The same attributes — especially high quality and trustworthy — are what people look for in new products and services. 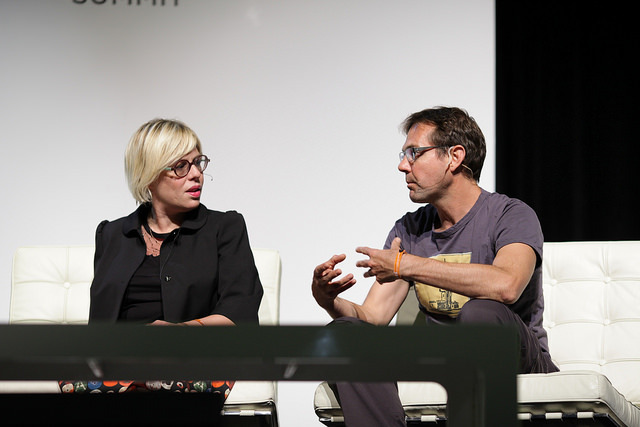 After presenting his findings, Rothman moderated a panel of marketers and agency executives to discuss the results. 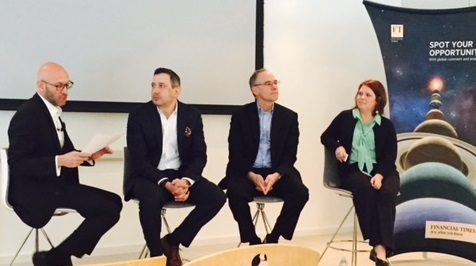 The panelists were Christine Bacon, Head of Advertising at Allianz Global Investors, David Rosenbaum, EVP, Group Account Director – LVMH at Havas and Matt Hickerson, Managing Director, Marketing & Communications at Macquarie Group. What is the brand’s DNA? What are my goals and what am I trying to accomplish? What is the right audience? Is the content provider the right environment for my brand? Brand reputations matter. Brand perception can change based on platforms. Smart brands want to be in smart environments. Quality over quantity. Brands are looking for quality interaction and will only make an impact if there is the right integration. Being on many different platforms and in front of a myriad of audiences is not always the answer. Content adjacency is key. Content adjacency problems are an ongoing issue. Brands can mitigate risk with high quality and collaborative briefs that focus on desired goals and outcomes. Thoroughly evaluate platforms. Well-established brands are not always looking to rush into new environments. And in certain categories (such as financial institutions and luxury products), many choose not to unless there is proven success by similar brands. Brands should properly evaluate each platform they partner with – it’s not always about being the first. “The Halo Study is an example of the commitment that FT has to providing our clients and the advertisement community at large with unique market insights. One of the advantages of the Financial Times is that we invest significant funds into analytics, which include campaigns performance analytics, brand lift studies, brand tracking studies as well as larger macro industry trend pieces,” said Rothman. While The Halo Study may not repeated for another two to three years, we can expect to see more research from the FT this year, including a study of Opinion Leaders and a Media Engagement study.